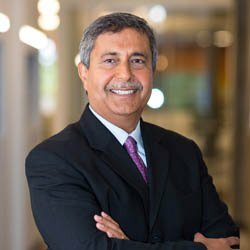 American memory specialist Micron has appointed semiconductor expert Sanjay Mehrotra as its president and CEO. Mehrotra co-founded another major memory company, SanDisk, in 1988 and served as its president and CEO from 2011 until 2016. He succeeds Mark Durcan, another veteran of the flash industry who was leading Micron for the past five years. “Sanjay has an outstanding track record of business success and exceptional knowledge of the memory and storage industry,” said Robert Switz, chairman of the board of directors and a member of the CEO selection committee. Mehrotra was born in India and originally came to the US to study engineering and computer science at UC Berkeley. According to Business Insider, he was denied student visa three times, before an emotional intervention from his father convinced the consular staff. After gaining experience in semiconductors at Intel, SEEQ Technology, Integrated Device Technology and Atmel, Mehrotra established SanDisk (then SunDisk) with fellow immigrants Eli Harari, originally from Israel, and Jack Yuan, born in Taiwan. During his nearly 30-year career with SanDisk, Mehrotra served as EVP and COO, SVP of engineering, VP of product development and director of memory design and product engineering, before eventually becoming the CEO. In May 2016, SanDisk was acquired by Western Digital in a $19 billion deal. Mehrotra is credited with guiding the development of products that made flash memory mainstream. He oversaw SanDisk’s highly successful partnership with Toshiba and established key manufacturing operations in China, Taiwan, Japan and Malaysia. He is also the author of more than 70 patents.